Hello my dear friends, how are you all doing today? I hope you are having a fabulous day. Recently, I was approached by Carolyn from lover.ly to participate in the ‘Dream Day Style Challenge’. I am going to be honest with you all, unlike most girls, I don’t ever dream of my wedding day. To be quite frank, I honestly don’t understand why girls would get all excited about wedding dresses, decorations and all that jazz. With that being said, I am by no means anti-wedding, anti-marriage or anything like that. So I thought this would still be a fun opportunity for me to try and create a collage of beautiful pieces for a wedding, I’m sure it will be fun and exciting for some of you and maybe for those of you who are brides-to-be, it can help give you some inspirations. I was given three possible venues to style, including a traditional wedding, beachside nuptials, or a rustic soirée. Since it’s currently summer, I thought the beach theme sounds like a great idea. So I put together some pieces that would really go with a beautiful summer beachside wedding, I hope you enjoy my picks. And of course, don’t forget to check out lover.ly for all things wedding. First, the most important part – the wedding dress. 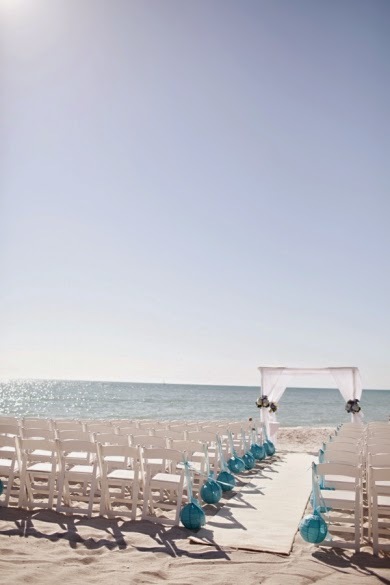 When I think of a beach wedding, I think of carefree style, dresses made of lightweight material flowing with the cool beach breeze, brides and brooms skipping barefooted on the warm sand, laughing their hearts out, yadi yadi yada you get the idea. So while I was browsing for the perfect wedding dress on lover.ly, I kept those images in mind. This particular dress really fits my imaginations. The sweet heart neckline and the lace detailing is romantic and beautiful, and the tiered skirt looks like it will flow like a dream on the beachside. Nailed it! Now comes the hard part – accessorizing. Like I said, I know very little about wedding, I honestly don’t know what goes with what, so if this offends you by any means, I apologize in advance. I thought the dress really speaks for itself with all the intricate lace-work, and the tiered skirt, I wanted to keep accessories at bare minimum. The only jewelry I picked out were those earrings. I am personally a big fan of silver, gold in my opinion, is not always the most classic choice. Those earrings are simple and delicate, with a touch of elegance, they are my picks for the beachside nuptials for sure. As for shoes, although I would love the bare-foot option, a pair of romantic sandals are a good idea as well. This pair I chose has a nice touch to it. Last but definitely not least, the veil. Again, I wanted to keep it lightweight and simple, I think you can tell by now the key word for me here is Flowy. So overall, my picks are rather simple, I don't like too much complications when it comes to weddings, now that I've given more thoughts to it. Here's a rather awful collage I made, I am absolutely horrible at collaging, so sorry! What are you ideal wedding looks? Please share with me down in the comment section.